El Niño: It's here, and it will boost global warming to record highs. Get ready for a long El Niño. Prepare to brush up on your Chris Farley impressions. After months and months of teasing forecasters, El Niño has officially arrived, and it’s set to boost global warming to new record levels. National Oceanic and Atmospheric Administration climate scientists reported the switch to official El Niño status in their latest technical bulletin on Thursday, and outlined their decision process in a blog post. What is El Niño, anyway? El Niño is one of the Earth’s most powerful climate signals, with the ability to shift weather patterns worldwide. It typically happens only two or three times in a decade, and its most important feature is its predictability. Once in place, El Niños normally linger for months, giving affected regions time to prepare for impacts. Technically, for an official El Niño episode, NOAA requires five consecutive three-month periods of abnormal warming of the so-called Nino3.4 region of the mid-tropical Pacific, about halfway between Indonesia and Peru. It usually takes a self-reinforcing link-up between the ocean and the atmosphere to achieve this, and it finally appears the atmosphere is playing its part. Is there anything special about this El Niño? El Niño transfers huge amounts of heat from the oceans to the atmosphere, and there are hints that this El Niño, combined with the already very warm global oceans, could bring about a new phase in global warming. An associated slow-moving indicator of Pacific Ocean temperatures, called the Pacific Decadal Oscillation, reached record levels in December and January. A persistently strong PDO is associated with cold winters in the East and drought in California—we’ve had both in abundance this year. Should the PDO stay strong, it’ll essentially join forces with El Niño and increase the odds that 2015 will rank as the warmest year on record globally. Last fall I wrote that a PDO signal like we’re currently seeing could kick off a surge of global warming over the next five to 10 years. What does El Niño mean for me? The 2015 El Niño could bring a litany of weather effects across the world, though NOAA cautions that it’s still pretty weak at this point so not much will immediately change. 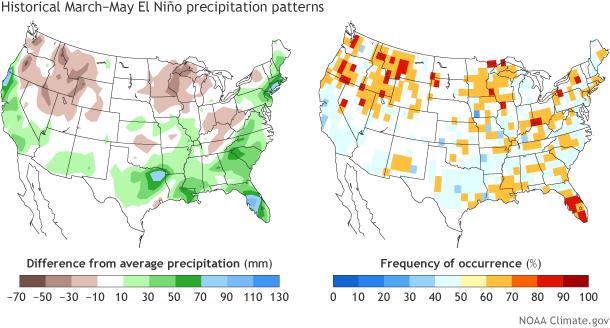 In the United States, typical springtime impacts of El Niño point toward wetter than normal conditions in California, the Southeast, and the East Coast. El Niño years are also associated with heavy snowfall in the Northeast, which we’ve for sure had already. “This El Nino is likely too late and too weak to provide much relief for drought-stricken California,” NOAA’s Mike Halpert, one of the agency’s official El Niño forecasters, said in a statement. Florida, on the other hand, has the strongest signal for short-term impacts—the next few months will likely be very rainy in the Sunshine State. In a video briefing, the International Research Institute for Climate and Society’s Tony Barnston, who helped make the decision official, explained that the slow build-up of warm water in the Pacific over the last several months has made it “a very unusual time to give an advisory for an El Niño.” El Niños usually start in mid-summer, not in early spring. This year’s sluggish onset may be because this year’s El Niño isn’t happening in the typical way. Close followers of the thermodynamics of the tropical Pacific (you know who you are) will note that borderline El Niño conditions have been around unofficially way back to last June. Finally, in February, the trade winds began to weaken across a vast stretch of the Pacific, causing an accumulation of subsurface heating. Forecasters now believe that the ocean and atmosphere have joined forces in such a way that further warming and shifts in global weather patterns are likely—and that was the key to declaring an official start to El Niño on Thursday. Steve Zebiak, a Columbia University climate scientist who helped issue the first successful prediction of El Niño in 1985, says he’s never seen anything like the run-up to the current El Niño. “There definitely are some questions here,” Zebiak told me in a phone interview. For awhile, Zebiak says that the run-up to this El Niño was looking like that first successfully predicted event. In the last few months, though, things have changed. “Now we’re in a situation where I can’t think of a good analog for this entire past 12 months over many decades,” Zebiak said. He thinks climate change may be shifting where El Niño forms—now closer to the central Pacific rather than near South America. The impacts of this shift aren’t yet fully understood, but this year will provide a great chance for further study. Typical El Niños last only for six or eight months, but we could be in for a long one this time, spanning parts of two years or more. By later this year, if forecasts hold, global temperatures should soar to new records, according to Zebiak. A consensus of dynamic climate models now show a strengthening of El Niño through late summer, though the reliability of the forecast models—which change throughout the year—is typically at its lowest right about now. Still, Zebiak says that if this El Niño advances across the Pacific as is currently predicted, 2015 would likely be the warmest year ever measured globally.